Copyright © 2018 Caroline Goulding. 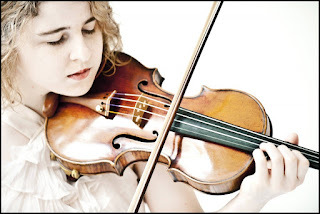 The virtuoso violinist Caroline Goudling has performed with the world’s premier orchestras, in recital and on record and has blossomed from a precociously gifted 13-year-old soloist with the Cleveland Orchestra to a mature virtuoso of skill and lyricism that is simply amazing. In 2009, when the violist was just 16, her debut release on Telarc was GRAMMY-nominated and chart-topping. Caroline’s recital album with pianist Danae Dörken on the ARS label includes works by Schumann, Enescu, and Dvorák. Since that 2006 Cleveland Orchestra debut, Caroline has gone on to appear as soloist with the symphony orchestras of Toronto, Detroit, Dallas, Houston, Nashville, Milwaukee, Pasadena, Alabama, Florida, the National Symphony, and the Orchestra of St. Luke’s. She has also appeared extensively in Europe and Asia with the Frankfurt Radio Symphony, Netherlands Philharmonic, Deutsche Radio Philharmonie, and the Hong Kong Philharmonic. She has appeared in recital at Carnegie Hall, Lincoln Center, the Kennedy Center, Beijing’s Forbidden City Concert Hall, the Tonhalle-Zurich, the Louvre Museum, the Isabella Stewart Gardner Museum, and she has performed as a chamber musician as part of the Marlboro Music Festival. Caroline was a recipient of the Avery Fisher Career Grant in 2011, and she won the Young Concert Artists International Auditions and was the recipient of the Helen Armstrong Violin Fellowship in 2009. She has also garnered significant attention from music and mainstream press appearing on NBC’s Today, MARTHA and Germany’s Stars von Morgen hosted by Rolando Villazón. Caroline has also been heard on NPR’s Performance Today, From the Top, and SiriusXM Satellite Radio. Goudling is the recipient of the THIERRY SCHERZ PRIZE. Sponsored by the Pro Scientia et Arte Foundation and the Friends of the Sommets Musicaux de Gstaad. One of the main goals of the Sommets Musicaux de Gstaad has always been to give young talents a chance, to help and guide them from the very start, the festival included into its program a series of concerts given in the Gstaad chapel by promising young musicians of different nationalities playing the same instrument. Every year, this Prize aims to reward one of these young musicians with the opportunity of recording a CD with an orchestra, produced by Claves Records, ensuring a wide distribution. This Prize gives the laureate experience with microphones, collaboration with a conductor, with orchestra musicians, an artistic director, sound engineers… and finally the joy of an extensive distribution. 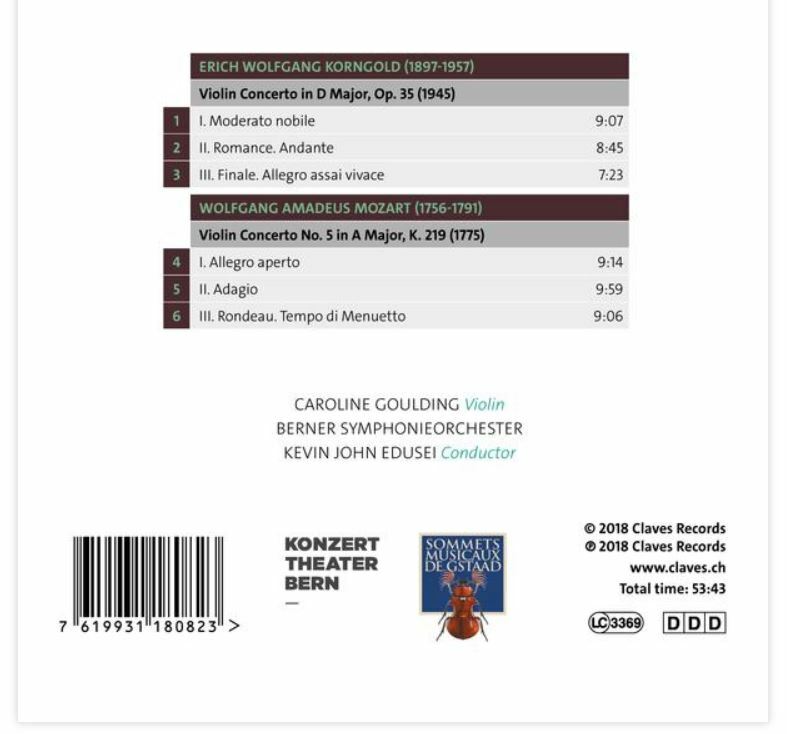 KORNGOLD & MOZART, VIOLIN CONCERTOS is the result and what a project for this violinist to demonstrate her command of the repertoire and her instrument. Our favorite track is “III. Finale. Allegro assai vivace” by Korngold The Berner Symphonieorchester under the direction of Kevin John Edusel. The balance and support of Goudling is brilliant. Gouding’s performance offers lively, colorful, accurate performances and is full of heart and passion. Her tone is aggressive, but warm, cathartic, but not overplayed. The flow is nice and the breaths all make for musical flow. Wonderful performance. It’s remarkable how Korngold uses timbre to keep the busy textures clear. Goudling brings lyricism to the music as well as passion. The program of Korngold and Motzart are an excellent pairing and this is a delightful presentation, both in sound and performance. “[…] The first half of this concert was fine enough, but the second half really hit it out of the park. Had Max Bruch left in place its original designation as a violin concerto, his Scottish Fantasy for violin and orchestra in E flat major, Op.46 would have fallen chronologically between his now-neglected second and third concertos, but the way in which its Scottish folk melodies rather than structure lead the ear, together with its introduction-plus-four-movement layout, make the final title more appropriate. The soloist was Caroline Goulding. Though still only in her mid-20s she had – as she said in her on-stage interview with Maestro Preu – been at the point in her career where she felt the need to withdraw for several months of meditation and self-discovery at a retreat in rural Montana. Now she is back on the concert platform, and if this performance was any indication, the timeout paid off big-time. Her playing was simply spellbinding, ranging from the veiled, husky, almost hesitant tone of her first quasi recitative that followed the Introduction’s somber opening orchestral chorale, to the whirlwind scales with which she, seemingly without effort, matched the conductor’s very fast speed for the finale (and with which the whole performance came in noticeably under its usual 30+ minute mark). ” […] ‘For the second half of the program, Preu turned his attention to more familiar fare. In Brahms’ Concerto in A minor for Violin, Cello and Orchestra (Op. 102), his soloists were Joshua Roman, who gave a fine account of Mason Bates’ Cello Concerto here in 2016, and violinist Caroline Goulding, in her first Portland Symphony appearance. Both played magnificently, and they took care to match each other’s phrasing so that the solo lines often had the tautness of a chamber music performance within the work’s grander textures. Icicles fall from the ceiling while gleams of light beams surge throughout the wooden hall of the Olivier Music Barn…..This is from late night sessions after hours in a beautiful space at Tippet Rise Arts Center in Fishtail, Montana! More to come soon including live video footage of…..
a lone soul practicing under a rather too-delicious-to-the-ear mic that induces trepidation in one to post and yet the most auspicious kind of awesomeness and shakiness particularly in the knee joints that comes along with being vulnerable is why we do what we do in the first place, so I am told by someone named I, so… here is to Living Life! Homage to creative boons Kathy Kasic and Mickey Houlihan for their ginormous hearts in filming, recording and life! “From the Glistening of the Stars under the Moonlight of A Rapturous Night!” … Bach’s Gavotte en Rondeau from Sonata no. 3 in E major ! Check Out A SneakPeak of Caroline’s New Record to Be Released this Spring! “Violinist Caroline Goulding returned to Symphony Hall as soloist in the Vivaldi, and offered an individual and thrilling interpretation of the beloved Baroque masterpiece. A lithe and emotive performer, Goulding made each movement of the four concertos dance. She entered fully into their virtuoso nature, tearing into the scales with an almost vengeful vigor, and relishing their introspective slow movements, ornamenting with taste and subtlety. Both soloist and SSO string-players put a Baroque vibrato-less sound to good use, and all seemed to enjoy employing sul ponticello effects in the Winter concerto. Harpsichordist Gregory Hayes’ skill as an elegant continuo player was exquisitely displayed in his lovely Adagiomolto from the Autumn Concerto, and principal cellist Aristides Rivas completed the continuo ensemble with great sensitivity. Caroline Goulding has been thinking a lot about Yehudi Menuhin. The 24-year-old violinist, like Menuhin, started young—picking up a violin at age three and debuting at 13 years old with the Cleveland Orchestra. By 16, she had her first Grammy nomination for her self-titled 2009 release on Telarc, which made the classical Billboard Top 15. Now, as Goulding is poised to present and perform the first concert program she’s ever curated, Menuhin seems to be following her. It started at the 2017 Sommets Musicaux de Gstaad, where Goulding received the Thierry Scherz Prize honoring the best performance with an opportunity to return and record an album under the Swiss label Claves Records. In 1957, Menuhin and his family moved to Gstaad, Switzerland, where he founded the Menuhin Festival. “I remember being there, in Gstaad, and I felt the heart of him. This flow was happening throughout this whole year. It really feels like the seeds were planted,” says Goulding, sitting across from me in a sundress and bare feet, pink bug bites dotting her porcelain skin. “I’m itching again!” The rural Montana mosquitoes at Tippet Rise Art Center—where she’s performing her program in four concerts over two days—have feasted on both of us, and I hand her a bottle of anti-itch spray. Goulding has been doing yoga since her studies at New England Conservatory. The practice piqued her curiosity about meditation, and she went to her first class in Boston with her classmate Luke Hsu. She’s been at it ever since, developing the program for Tippet Rise at the Colorado-based Buddhist meditation retreat Shambhala Mountain Center and at Karmê Chöling in Vermont. The title of her program, presented July 14 and 15 with Joshua Roman on cello and David Fung on piano, is cryptic at first—Universe as Poet: Transfiguration through Cycles, Sages, and the Collective Unconscious. Not even Goulding can explain it in clear, concise language. Yet as the performances unfold and she becomes increasingly vulnerable, she reveals herself as not just a virtuosic violinist, but as a young woman in the throes of discovering who she is. Both in the music and in the unpredictable moments—watching the summer breeze blow her sheet music off the stand or her string break mid-solo—she allows us to witness her figuring it out. Tippet Rise is the ideal environment for such an experiment. An 11,000-acre working ranch in south-central Montana, north of Yellowstone National Park, its vast landscape—peppered with large-scale sculptures by world-class artists—makes you feel like anything is possible. Nestled in the foothills of the Beartooth Mountains, Tippet Rise’s rugged canyons, high meadows, and big sky glow in washes of gold, olive, and azure. Sheep and cows outnumber the people here, even in the summer months when Tippet Rise hosts concert-goers in the 150-seat Olivier Music Barn and sculpture tours. Philanthropist couple Peter and Cathy Halstead modeled the space after Storm King Art Center in New York’s Hudson Valley, and incorporated their passion for classical music (Peter is a pianist) with a summer music program that’s attracted top string players since its inaugural 2016 season, including Goulding and cellist Matt Haimovitz who both returned for the 2017 season. Goulding’s first season at Tippet Rise was curated by then-musical director Christopher O’Riley, host of NPR’s From the Top and a longtime friend of the Halsteads, but this year she was offered an opportunity to create a program from scratch. With Peter Halstead as her mentor, Goulding shaped the program around emotionally weighty and technically challenging pieces, which included Schoenberg’s seminal Verklärte Nacht (Transfigured Night), Op. 4; Ravel’s posthumous Sonata for Violin and Cello in C major; Enescu’s Impressions from Childhood, Op. 28; Beethoven’s Piano Trio, Op. 70, No. 2, in E-flat major; and three pieces by one of Goulding’s favorite composers, Schumann: 6 Studies in the Form of Canons, Piano Trio No. 3 in G minor, Op. 110, and Sonata for Violin and Piano No. 2 in D minor. Her career has so far checked many of the boxes of your typical violin virtuoso: summer festivals at Marlboro, Yellow Barn, and the Aspen Music Festival—where at 13 she won first prize in the concerto competition; at 14, she appeared on O’Riley’s PBS program From the Top: Live from Carnegie Hall; by 16, she was offered a three-album recording deal with Telarc and won first prize at the Young Concert Artists International Auditions; at 18, she received an Avery Fisher Career Grant and started studying with Donald Weilerstein at the New England Conservatory. Working with Weilerstein sparked Goulding’s interest in yoga, and eventually meditation, though the famed violin teacher never directly spoke of either practice. The harmony is evident in her interactions with Roman and Fung, who allow her to lead them into dissonant and chaotic places. In Verklärte Nacht, the trio breathes each note together, which run the gamut of strained and atonal to a symphonic wall of sound. Goulding plays with her entire body, but reveals little in her expression—mostly hidden behind her curly blonde bob—until the piece ends. The three musicians are awash with relief, letting the tension go in a shared grin as the sun sets behind them in Olivier Barn’s massive picture window. The audience exhales too, before bursting into applause and jumping to its feet. Crows fly in the distance, gathering to roost, and night is nearly upon us. I don’t know if it’s transfigured, but somehow, we are. The next morning, we head to Domo—a massive, cave-like sculpture formed in concrete and created by the Spanish architecture firm Ensamble Studio specifically for Tippet Rise. The audience is seated beneath the sculpture and encircles a small stage; the space feels incredibly intimate despite the fact that we’re perched on a high meadow with expansive views from every angle. Nature pays us no mind and in the middle of Schumann’s 6 Studies in the Form of Canons, the wind whips through Domo’s narrow passages and Goulding’s sheet music flies off her stand. An audience member grabs the pages from the gravel and the trio continues without regard. There’s a long break as Goulding and Roman scramble to organize her music and the audience whispers over the buzzing sound of grasshoppers in flight. The trio fully rebounds during Beethoven’s Op. 70, No. 2, which revs into a call and response bursting with phrasing that feels like a delicate dance of power and restraint. As she launches into the sombre opening of Impressions from Childhood, Goulding captures the mystery and innocence of Enescu’s memories by making her violin moan and gasp and whistle like the eerie ghost of a freight train. It’s still Romantic, but not pretty per se, and Fung matches her mood with brooding and rumbling fingerwork. He also supplies the piece’s birdsong and cuckoo-clock sounds—so convincingly that I scanned the barn’s pitched roof for evidence of a trapped bird. As Goulding builds into a frenetic crescendo during the final movement, Lever de soleil (Sunrise), her fervent, all-consuming effort is interrupted when a string snaps. The spell is suddenly broken, and Goulding straightens her body and announces the show’s over in a deadpan tone. Fung reassures the audience, “We’ll be back,” as they retreat backstage to repair the string. The audience swells with excited chatter, as many still don’t know that Goulding was kidding, and we wait to see what will happen next. Goulding and Fung return with smiles, reprising the movement with the same energy as when they left it—perhaps even more. Goulding faces the audience with a new confidence, fully revealing the concentrated expression behind her blonde bob. It feels like the string was meant to break, as if the music required it, and Goulding and Fung and the audience are further bonded as a result. But why did she seem more confident after the string broke, I press. “That’s where the meditation has informed the music. It’s impacting the way I’m operating in the world—through surrendering control—which is a similar thing that happens in art. When you’re surrendering, you’re letting go of that narrative you’ve told yourself a million times over and over again. It could still be there in the background—it’s not like you get to a point and it’s like ‘Oh, it’s not there anymore, it’s all perfect.’ You’re surrendering that illusion of who you’ve been or who you are for the reality of the moment, which is the only reality that we ever have. You’re becoming embodied. You’re becoming in harmony with everything there is. THE CHAIR: Making Womens’ Voices Heard!